Paris (France) (AFP) - President Emmanuel Macron sought to clarify his comments on French and US miliary operations in Syria on Monday, saying both countries were committed to finishing the battle against the Islamic State group and helping the peace process there. Macron said on Sunday evening that Paris had convinced US President Donald Trump to stay engaged in Syria "for the long-term" -- but just hours later the White House responded by saying it wanted US forces there "to come home as quickly as possible". Asked about a difference in position, Macron said both countries had the same military goal but also had the same long-term target of building a stable and peaceful Syria. "We have one military objective and only one: the war against ISIS," he told a press conference, using an alternative name for the Islamic State extremist group that is also sometimes to referred to as Daesh. "The White House is right to recall that the military engagement is against Daesh and will finish the day that the war against Daesh has been completed. France has the same position," he said. "I suggested no change last night." The US, France and Britain carried out joint strikes against Syrian chemical weapons installations on Saturday morning in response to an alleged chemical attack on civilians by regime forces. "I am right to say that the United States, because they decided to carry out this intervention, have realised that our responsibility goes beyond the fight against Daesh and that it was also a humanitarian responsibility on the ground and a long-term responsibility to build peace," Macron added. Referring to a recent promise from Trump to bring home American troops operating in Syria, Macron told his interviewers on Sunday that he had helped change the US president's mind. "I assure you, we have convinced him that it is necessary to stay for the long-term," he said. France and other European nations had been alarmed by Trump's comments about ending America's presence in Syria, which contradicted messages from US military leaders and raised fears that IS could stage a resurgence. Despite a string of military victories that have driven the group back, IS militants are still in control of pockets of land in Syria. 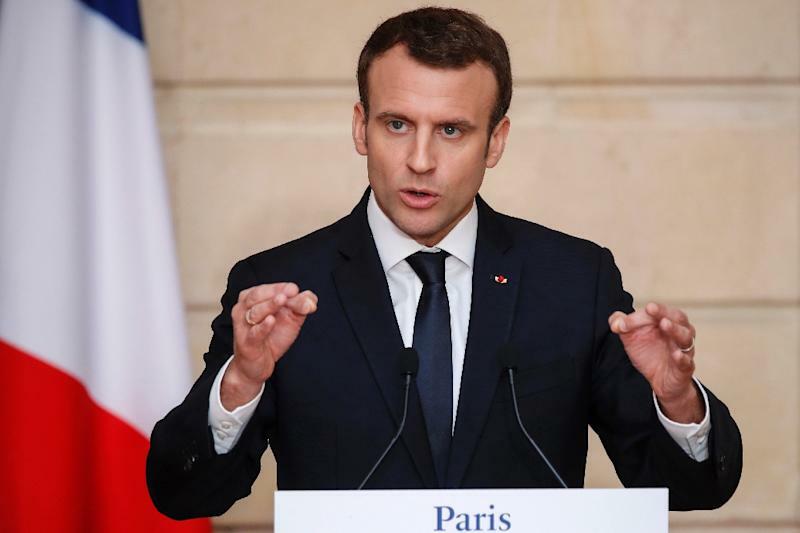 Macron also said on Sunday that the Western intervention in Syria on Saturday had driven a wedge between Turkey and Russia, which have been building increasingly close ties -- to the consternation of Europe and the US. Turkish politicians rejected the suggestion on Monday. "We can think differently but they (our relations with Russia) are not so weak that the French president can break them," Foreign Minister Mevlut Cavusoglu said at a press conference with NATO Secretary General Jens Stoltenberg. "We have strong relations with Russia," Cavusoglu added.